Macy’s mobile self storage is more than just a storage facility. We can be someone that will be with you during every stage of your life. Life is mostly about changes. Nothing is set in stone. In every step of the way, in every turn, things can change. And do you realise the great irony? As much as we are fond of striding through the odds and challenging our limits, we are all creatures of habit. Change messes with us more than we realise. The bigger the change is, the more difficult for us to recover and adapt. This is also the reason why we are social beings. Having people around us gives us the strength to go through different changes. People that will be with us to guide and assist. Just as Macy’s. More than you might realise, we can help you go through the different stages of your life, even the most difficult and trying stages. And so, with the good ones. We can be a friend that will help you stand on your feet again. Or just help you stride through. So, here’s the deal, you were happy in your old apartment then you met someone and moved into his/her place. Then after a while, things turn the other way around. You are now both hurt and homeless. Now, you’ve been with your partner for quite a while by now which is why you’ve got so much stuff to bring with you. You can probably find a friend that would let you crash in for a few days, but not your stuff. It would be asking too much. Leave your stuff to Macy’s mobile self storage. Then get yourself back on your feet again. Rest assured that we can certainly get you a good bargain till you’re ready for all your possessions again. Losing the one you love does not really take you to the edge of your life. It could be just a prelude to a new chapter. And we are willing to be with you as you go on this transition. Retirement is when you sit down by the river to fish. When you’re done working and the only work left for you is to reminisce each moment that passed you by. It’s like living the dream to some. Only because there is no more need to work. You’ve earned enough to get you by. But to many people, it also means having to see your kids leave. They will need to live their own lives away from the home where they grew. You’d be lucky if both you and your partner are still together at this stage of your life. But still, its sad to have to let the kids go. Part of this change is the fact that there is less stuff in your house now. And the situation may offer an opportunity to move to a smaller and simpler home. This is when we can come to your aid. Moving from a bigger house to a small one would mean that there will be stuff that you’d need to let go. This is cool. Except that, not all of them are expendable. Of course, there will be some stuff that carries memories with them. And thus, it’s best to store them in the best self storage services in Sydney. Losing someone is stressful enough. But affairs after burial is even worse. Not to mention, being stuck to dealing with the possessions of the deceased. As much as how we’d like to stay strong for the remaining members of the family. It would really be difficult to let go. That’s why you have the option to store some of the belongings of the deceased with Macy’s mobile self storage. So, when you need to reminisce their memories. You can conveniently come by our facility and see the stuff. Whichever be your reason for leasing, it’s always difficult to just sell your home. Especially if you’ve lived on it for years. The older the house is, the more memories it stores. But then, selling the house would be mean de-cluttering it. You will need to clean it up for it to be ready for sale. Hence, you will need to store the stuff that you can’t take with you. Both the ones you will be selling along or the ones you need to keep. Macy’s mobile self storage will be happy to come to your aid. And you will not have to worry about security. We have secure self storage for you. Along with getting children is getting more clutter in the house. Heaps of toys, books, and all other kid’s things. But what is that compared to the joy do you kids bring? Give them more space in your house and let go of some of your possessions that do not have much relevance to your daily life at home. So, to free up more space for your kid’s affairs. They can only be kids once in their life. Let them have the most of it. 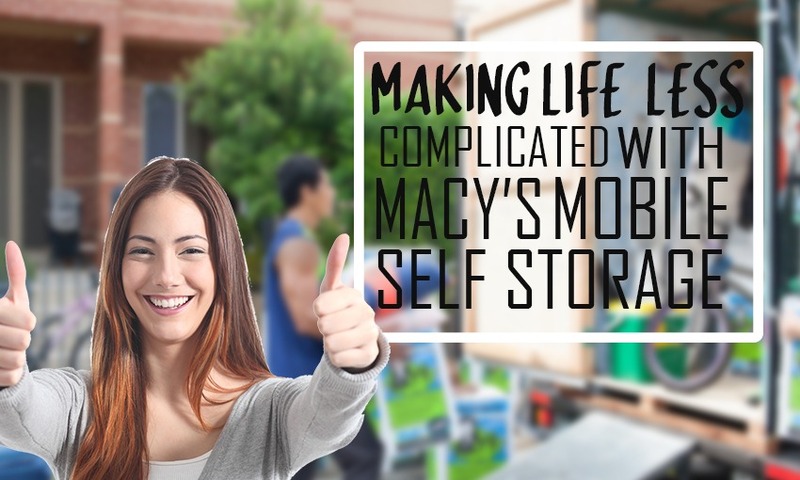 There are still way more life stages when Macy’s mobile self storage can come to your aid. As long as its an issue of space, we’ll be happy to store for you. Call us today for your bookings. Try the storage calculator and get your free instant quote now. This entry was posted in Storage and tagged self storage facility, self storage sydney, short term self storage.